A basic swimming pool is a wonderful way to escape the summer heat, but upgraded features will transform your pool into a backyard paradise that reflects your family’s unique outdoor style. 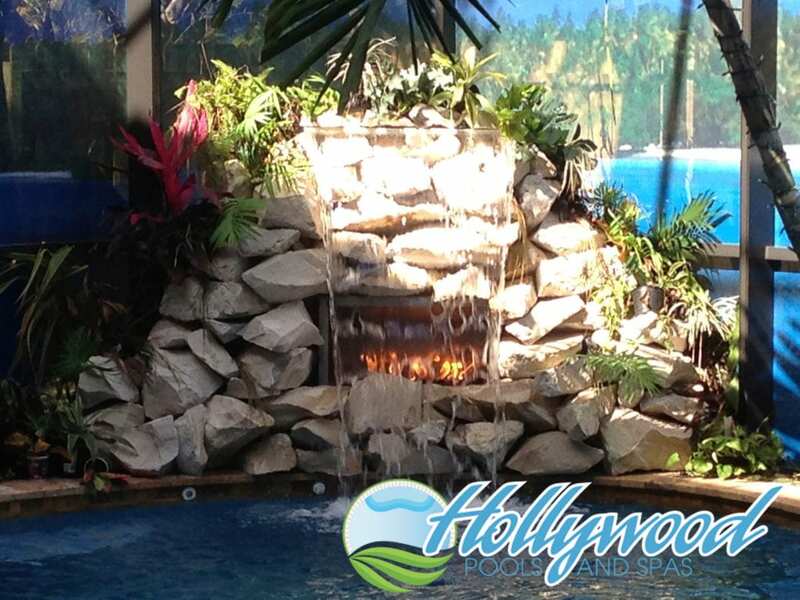 Hollywood Pools and Spas offers a wide range of unique and innovative features for your swimming pool. Pool options are available from quality manufacturers and are designed to complement your backyard environment and provide years of reliable service. Existing pool owners are encouraged to bring in pool photos to share with our design professionals. We can make recommendations and show you product samples to help find the appropriate upgrades that match your pool’s style and ambiance. There are many pool features to choose from that will fit virtually any budget. Waterfalls have become one of the most popular pool accessories. The flow of water over rock outcroppings creates a sense of warmth and tranquility. Some people choose to install two or more waterfalls to increase the dramatic effect. We offer numerous waterfall styles including rock, stone, block, cascade, plunge, fan, horsetail and punch bowl. A salt generator is the perfect alternative for those looking to avoid the mess and inconvenience associated with chlorine tablets. Since they are self-regulating and require almost no maintenance, salt generators are very popular upgrades. Chlorine is produced by applying a small electrical charge to the salt molecules, which creates the chlorine your pool needs to keep the water crystal-clear. Swim-up wet bars require a great deal of design expertise, and very few pool contractors in Florida have the skill and experience to undertake such a complex project. At Hollywood Pools and Spas, our swim-up bars are custom-designed for each project. We only install the finest quality countertops and tables built to withstand Florida’s extreme heat. Many swim-up bars are accompanied by a barbecue island and kitchen for the ultimate in outdoor relaxation and entertainment. Vanishing edges provide a dramatic effect that gives your pool a sense of style and elegance. Vanishing or Infinity edge pools are particularly effective if your backyard has a view of the mountains or city lights. Even in conventional backyards, a vanishing edge pool can still present a stunning effect if the water drops into a lower basin. Modern lighting adds beauty to your pool and extends the amount of time you can spend in the water each day. Lighting options include standard white, multicolored, LED and fiber optics. Lights can be arranged in virtually any configuration to illuminate your pool, water features and backyard landscape. Hollywood Pools and Spas has a complete array of pool options and features designed to give your pool a look of modern elegance while also enhancing its functionality. Call one of our representatives today to learn about the many budget-friendly options and upgrades available for your pool. When you install automated controls, many of the unpleasant tasks associated with pool ownership are managed automatically, including pumps, filtration, lights, jets, heaters, chemical feeders and other electrical components paired with the system. It is no wonder that 90 percent of the new pools installed in Sunbelt states include remote control capabilities. Remote control pool and remote control spa systems communicate wirelessly to manage the majority of your pool’s mechanical functions. Most remote controls are waterproof and provide a large, easy-to-read touchscreen interface. Many controls can be accessed directly from your mobile phone or tablet, which provides useful information such as water temperature, chlorine levels, jet status, lighting and auxiliary system status indicators. Most systems also offer 24-hour monitoring and two-way communication. Advanced pool and spa remote controls provide a cost-effective method for direct management of pool and spa systems. Large user-friendly control panels provide easy-to-navigate menus for full programmability, complete system setup and monitoring. Most system remotes can be configured to control the pool or the spa only, pool/spa in combination, and a salt-chlorine generator. Unlike older automated systems, today’s remote controls use wireless technology, which eliminates the need for hard-wire installation and drilling into walls or patios. Hollywood Pools and Spas has the knowledge and expertise to answer all of your questions and present the best pool and spa remote control options. If you live in Pinellas County or Hillsborough County, we encourage you to explore the many benefits provided by a pool and spa remote control automated system.